class="page-template-default page page-id-4037 wpb-js-composer js-comp-ver-3.6.12 vc_responsive"
We send our program FREE OF CHARGE to public and community radio stations anywhere in the world. You are invited to e-mail us at radio@woodsongs.com or call us at 859-255-5700. PLEASE NOTE: this page is being redesigned and has not been updated, please be patient as some information changes. 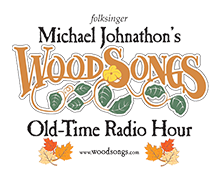 WOODSONGS FANS: call your hometown radio or public TV station, ask for the Program Director and request WoodSongs to be added to their program schedule. Have them contact us at the email/phone above and we will work with them. Check your local station for WoodSongs airtimes. Support your hometown public radio and TV station ESPECIALLY during their fund drive. Public radio and public TV stations are the greatest supporters of the arts available and we all need them to stay healthy. COMING SOON: fans and students can visit the global WoodSongs Archives of past shows, audience and promotion materials, Michael’s stage scripts with original notes and more at the John Jacob Niles Center for American Music at University of Kentucky in Lexington, KY.